Lately I’ve been tracking what I eat using Dr. Greger’s Daily Dozen app on my phone. (Check it out on iTunes or Google Play.) It appears I’m missing out on cruciferous vegetables and greens. So I came up with a strategy, make a bag of frozen vegetables (cruciferous, of course) and have them with lunch and dinner. So now I’ve tackled one problem but not the other. It’s not that I don’t like greens, well maybe that is it. Anyway I have to trick myself into eating the kale staring at me every time I open the fridge. So I thought why not throw all the leftover vegetables into my Instant Pot and see what happens? It turned out I had a few items clamoring to be used. 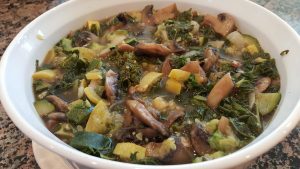 A bunch of semi-wilted kale, half an onion, zucchini, yellow squash and mushrooms. I added some garlic and tamari and about 1 cup of my favorite broth mix from My Plant-Based Family. First I had to clean and chop everything. I sliced the onion and left them in pretty large pieces. The mushrooms were already sliced saving some time. 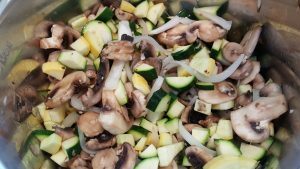 I diced the zucchini and squash small so they would cook quickly. Also, after cleaning the kale I chopped it into a mix of ribbons and smaller pieces. 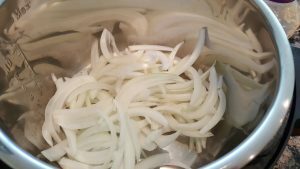 Then I began by setting the Instant Pot to sauté and adding the onions. After they cooked for about 3 minutes it was time to add the mushrooms and garlic. 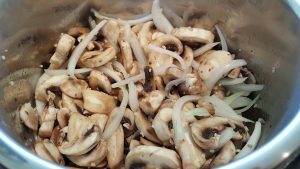 It took about 3 minutes of cooking and stirring for the mushrooms to cook. Then it was time to add the zucchini and squash. After stirring everything really well I added the kale, tamari and broth over the top. Closed and set the Instant Pot to 3 minutes. I did a quick release when it was finished. Time to test the results! It’s delicious. Maybe next time I should add my cruciferous vegetables and get two checks with one recipe. Turn Instant Pot (IP) on saute. Add onions and saute for about 3 minutes or until translucent. Add mushrooms and garlic. Saute about 2-3 minutes. Add zucchini and squash, mix well. Add kale, tamari and broth on top and close lid. Set IP on manual for 3 minutes. Quick release.